RipSkirt is an athletic wrap that provides coverage over your bathing suit, yoga wear, or bike pants. X-Small: Fits people US size 00-2. Length of skirt: 14.75"
Small: Fits people US size 4-6. Length of skirt: 15.5"
Medium: Fits people US size 8-10. Length of skirt: 16"
Large: Fits people US size 12-14. 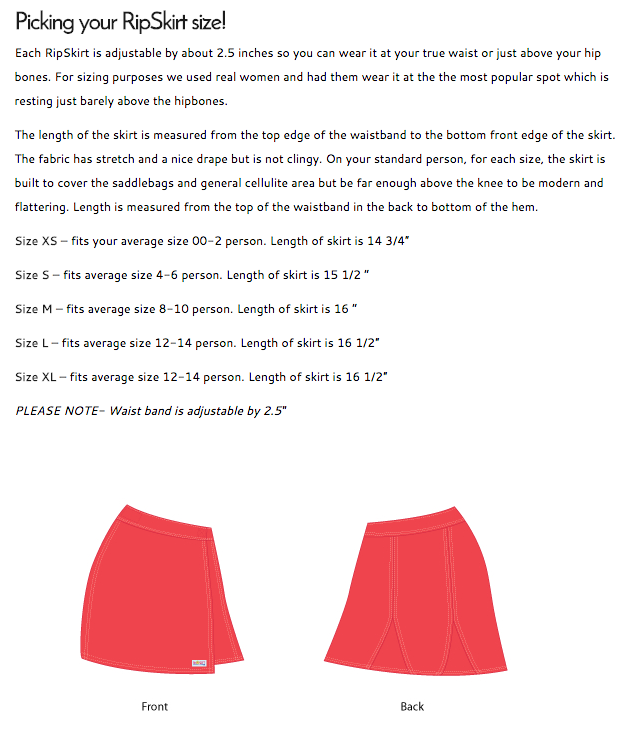 Length of skirt: 16.5"
X-Large: Fits people US size 16-18. Length of skirt: 16.5"
Sizing Note: Waistband is adjustable by 3"
True to size and easy to use Velcro. Cute swing to skirt with great cover-up! If you're self-conscious and feeling over-exposed in a bathing suit, yoga pants or bike shorts, don’t worry, we’ve got you covered with RipSkirt, a sporty, water-repellant wrap. With no snaps or zippers, it easily fastens with adjustable tabs. Designed by Hawaii-based entrepreneur, Alecia Elsasser, this active mom set out to conceal her own “rear exposure” as she ran from beach to supermarket to school pickup. Fabricated with surfer board-short material, the skirt has enough give to cover and offers free range of movement, without being clingy. The hook-and-loop fasteners adjust easily and the quick dry material protects seats from wet bottoms. A hidden inside pocket adds a bit of storage for keys, cash or a credit card. Layer it for a look that seamlessly transitions from activities to errands.